(1) advised political leaders; (2) offered practical recommendations; (3) encouraged a common identity; (4) denounced violence; (5) kept communication lines open. Religious actors can also mobilize tools/resources particular to their religioustraditions—prayer, sacred texts, religious values, etc.—to persuade conflict parties and the broader public to abstain from violence and/or to participate in peacemaking and reconciliation efforts. “20 years after the Good Friday Agreement, few people recognize how Northern Ireland’s religious leaders helped bring peace”. By Nukhet Sandal for Monkey Cage. April 10, 2018. 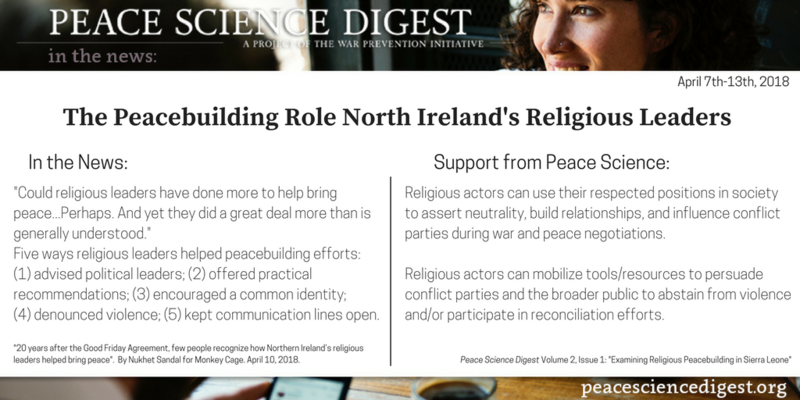 Peace Science Digest Volume 2, Issue 1: “Examining Religious Peacebuilding in Sierra Leone”.